A washing machine walking around the laundry room under its own power is a sure sign of an imbalanced condition. If the load bunches up on one side of the tub, the momentum created during the spin cycle causes the washer to gyrate violently. To compound the problem, the excessive movement eventually causes the washer to become unlevel. 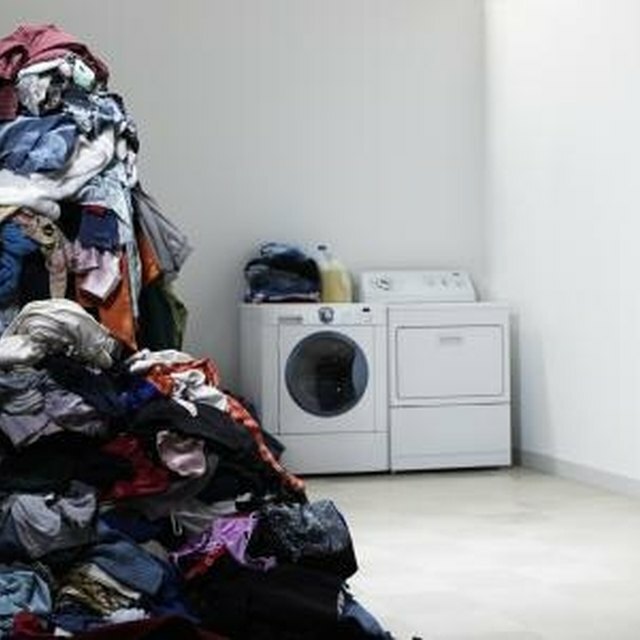 Once the machine is unlevel, efforts to balance the load are futile without first leveling the washing machine. An unbalanced washing machine creates havoc in the laundry room. Drain the water from the Kenmore washer and unload its content. An empty washing machine is easier to tilt for leveling. Place a 2 by 4 under the front lip of the washing machine. Use a board that spans the full width of the washer. Tilt the machine backward and position the board behind the two front feet. Examine the front feet. Ensure they screw into the washing machine's frame by the same distance on each side. If either foot is longer or shorter than the other is, adjust the feet to expose an equal amount of threads on each. A pair of pliers and a small crescent wrench are the only tools necessary. Tighten the jam nut against the washing machine frame on each of the front feet. Hold each foot in place with the pliers and tighten the nut against the frame. The jam nut prevents the feet from backing out further. Tilt the machine backward and remove the 2 by 4 from underneath the machine. Set the machine down and close the washer's lid. Grasp the washing machine with both hands. While standing in front of the washer, reach over the top and grab both top corners. Pull the machine forward and tilt it onto the front two feet. Lift the rear of the washing machine approximately four inches off the floor. Push the washing machine back onto all four feet. The rear feet on the Kenmore washer are self-leveling. Tilting the washer forward and firmly pushing it back down allows the rear feet to find level. Check the washing machine with a bubble level. Place the level across the top of the machine from left to right. Check the bubble on the level for a center condition. Then, place the level from front to back across the top of the machine and check the bubble. If a minor adjustment is necessary, make the adjustment at the front two feet. Shake the washer slightly by hand to ensure it is firmly planted on the floor with all four feet. Reload the cloths and distribute the load evenly around the washing machine tub. Ensure the washing machine is on a flat surface for proper leveling. What Can I Use to Raise a Washing Machine's Height?